On February 19, 2015 took place ceremonial meeting of the Academic Council of the St. Petersburg State Architectural and Civil Engineering University (SPbSACU, Russia). The Rector of the SPbSACU, Professor E. I. Rybnov opened a meeting. 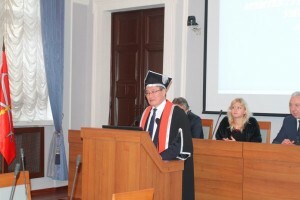 A significant event was the ceremony of awarding the title of “Honorary Doctor of SPbSAСU” to Professor Askar Zhussupbekov, Director of Geotechnical institute. The Head of the Department of Design of Buildings and Constructions of the L. N. Gumilyov Eurasian National University, The President of Kazakhstan Geotechnical Society, Chair of TC305 (ISSMGE) “Geotechnical Infrastructure for Megacities and New Capitals” (Astana, Kazakhstan), Life member of SEAGS. The Head of the Department of Geotechnics of SPbSACU, Professor Rashid Mangushev (Member of Board of Russian Society for Soil Mechanics, Geotechnics and Foundation Engineering) spoke on behalf with representation of Civil Engineering Faculty of SPbSACU about assignment to A. Zh. Zhussupbekov of an honorary title “for a contribution to development of scientific activity in the field of geotechnics, strengthening of the international scientific relations, including between higher education institutions of the Russian Federation and the Republic of Kazakhstan”, and also for establishing by him high collaboration between Russian Society for Soil Mechanics, Geotechnics and Foundation Engineering and Kazakhstan Geotechnical Society. The Rector of SPbSAСU Evgeny Rybnov congratulated Professor A. Zh. Zhussupbekov, handed him honorary the diploma, and also dressed in a cloak of the honorable doctor and donned a confederation-cap (Fig.1). In response, Professor A. Zh. 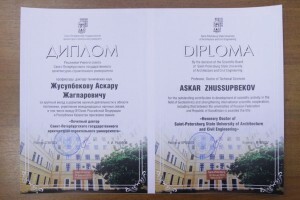 Zhussupbekov thanked the Academic Council of SPbSACU for the Honorary Diploma (Fig.2). In his invited lecture, he reviewed the recent achievements of the Geotechnical Institute at L.N. Gumilyov Eurasian National University (Astana, Kazakhstan) in Geotechnics by examples of unique buildings in Astana (Fig.3). In 1977, A. Zh. 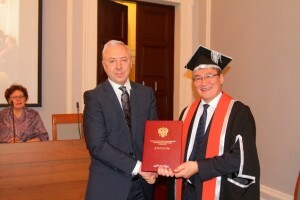 Zhussupbekov graduated from the Civil Engineering Faculty of the Leningrad Civil Engineering Institute (now SPbSAСU). His professional career related to geotechnics and foundation engineering in special engineering geological conditions of the Central and Western cities of Kazakhstan, soft soils of St. Petersburg (Russia), the countries of Central Asia. Currently Professor Askar Zhussupbekov is the international expert of the UN (New York, USA) and of EXPO- 2017 (Astana, Kazakhstan) in constructions of green power energy facilities at Astana (New Capital of Kazakhstan). A.Zh. Zhussupbekov has made a major contribution to the development of the engineering and scientific activities, implemented scientific development in the construction of a number of unique industrial projects: Karachaganak gas condensate field; Caspian integrated pipeline; the refinery in Karabotane; offshore oil and gas installations (Caspian Sea, Kazakhstan); Projects «Sakhalin 1» and «Sakhalin 2» (Russia), etc. For many years Askar Zhussupbekov supports with SPbSAСU close connections. In 2003 and 2004 he was the initiator of allocation to Students of University (SPbSACU) of a grant from the Kazakhstan Geotechnical Society. For last 15 years he is the permanent member of organizational and scientific committees on carrying out the all-Russian and international geotechnical conferences on Disaster Prevention, which was held in Saint-Petersburg, Moscow, Khabarovsk, Yuzhno-Sakhalinsk, Novosibirsk, Kazan, Perm, Omsk (Russia) and also in Harbin (China), Incheon (South Korea), Bandung (Indonesia), Taipei (Taiwan), Chennai (India) as well. In closing ceremony of the Academic Council (about 80 members) of SPbSACU Prof. Askar Zhussupbekov was invited of Russian VIP specialists to participate of 15 ARC (Fukuoka, Japan, 2015) and also 19th ICSMGE (Seoul, South Korea, 2017), especially for technical sessions of TC305 of ISSMGE.